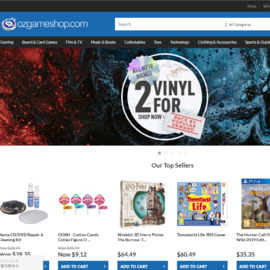 ozgameshop are one of Australia's biggest retailers of video games & board games. Exclusive discount codes for affiliates upon request. *4% cashback for new customers. *1% cashback for returning customers. *1% cashback on orders with coupons. *0.8% cashback on video game consoles. Click a Coupon or click Start Shopping to earn Up to 4% Cash Back at OzGameShop.